Hello and Happy December! It’s Amy here! Where have the days gone? I simply cannot believe that we’re already into December! 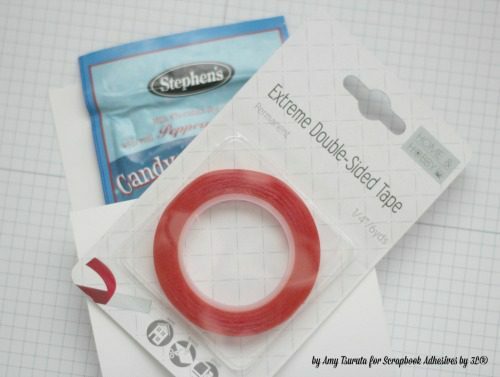 I have a fun little giftie idea for you today using Extreme Double-Sided Tape 1/4″. I started off with an A2 card base that was top folded. I flipped it upside down so that the scoring was on the bottom. I trimmed the top panel down to 3 1/2 inches. The Extreme Double-Sided Tape 1/4″ is the perfect adhesive for this type of project. I constructed the pocket by adhering strips on either side of the pocket panel. I make sure to burnish the area with my bone folder. The cup/mug have been adhered with Thin 3D Foam Squares Mix White. All the other panels on my pocket front have been adhered with the E-Z Runner® Grand Dispenser . I finished off the fronts with wood veneer snowflakes. These will go postal to my kids who are in college. This entry was posted in 3D Foam Squares, Adhesives, Cards, Crafts & Tutorials, E-Z Runner® Dispensers, E-Z Runner® Grand, Extreme Double-Sided Tapes, HomeHobby by 3L, Permanent Adhesive, Seasonal Craft Ideas, Tutorial, Winter and tagged Amy Tsuruta, Bazzill Basics Paper, E-Z Runner Grand Dispenser, Extreme Double-Sided Tape 1/4", Kuretake, Lawn Fawn, Sunny Studio Stamps, Thin 3D Foam Squares White, Zig. Bookmark the permalink. 14 Responses to "Christmas Treats with Extreme Double-Sided Tape"
Ohhhhhhhh I just loveeeeeeeeeeee these!! What a fabulous idea!!!!!!!!!!!!!!!!!!!!!!!!! Super-cute…love the treat holder idea! Oh my… these are adorable!! What a great little gift… you’ve got my wheels turning! This is such a great idea, Amy, and so adorable! We have a group of elderly ladies at church that have their own Sunday School class, and I think I will make some of these for them! Thanks for sharing! 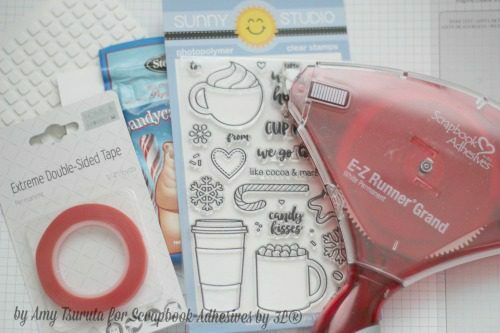 Love my Scrapbook Adhesives…could not create without them! 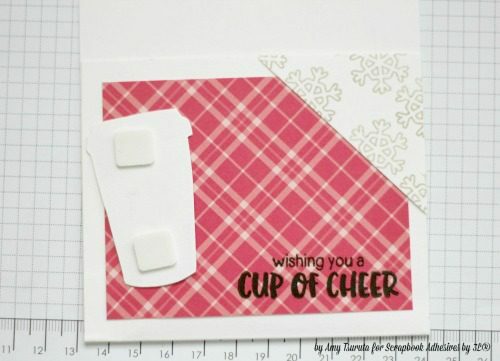 Amy, such an adorable, fun project, thanks for sharing! 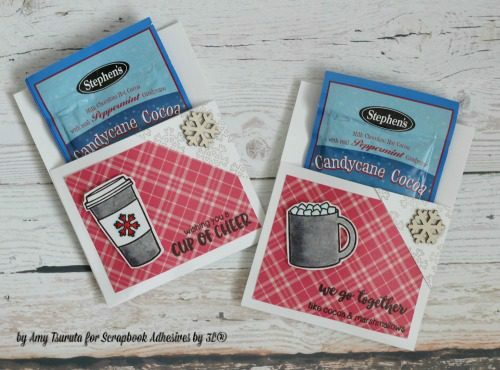 these are so darn cute….would be great student gifts for Christmas. Such sweet projects Amy!!! Beautiful idea!!! This is adorable way of giving in this joyous month, Amy! LOVE the cup and mug on those pockets, too! Absolute sweetness in every way, Amy! What a wonderful way to jazz up little treats! 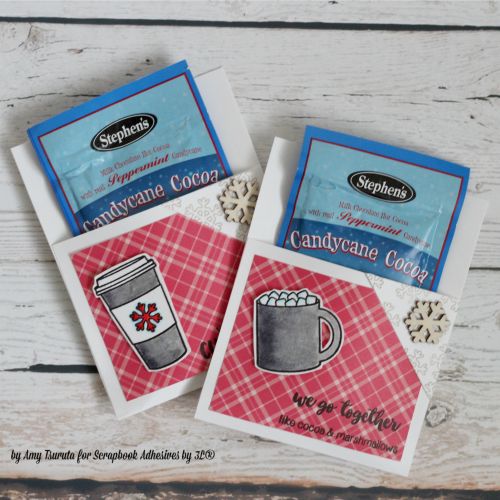 These little cocoa gift packets are amazing Amy! Super cute project, Amy! Love that there’s no pattern necessary and it’s postal friendly too!